In a number of our previous articles we have stated that South Africa is actually a dry country with an average rainfall overall of plus minus 495 mm per year. We have also concluded that droughts are part and parcel of our South African agricultural environment. Therefore it is absolute necessary that we must farm keeping in mind that we will experience drought again. Better to be prepared for it than to be unprepared. Whether the existing drought will continue or whether we will experience a more moderate summer season is not quite clear yet and reports at this point in time are a bit contradicting. However, it is a fact that the drought will be broken at some stage, but we must accept that the next drought is already on its way. When it will occur we do not know. Whether it will be in a year or two or a couple of years we must prepare ourselves for that. To manage your business very well the management of all areas – production, marketing, purchasing, administrative, human resources, public relations, assets and stock, general and financial management must be very good. However, of all the areas of management, financial management is the most important one with regards to preparing yourself for the next drought. To face the challenges of the ever changing business environment the modern farmer, big or small, must be a champion producer but also a superb financial manager – therefore a skilled business manager. 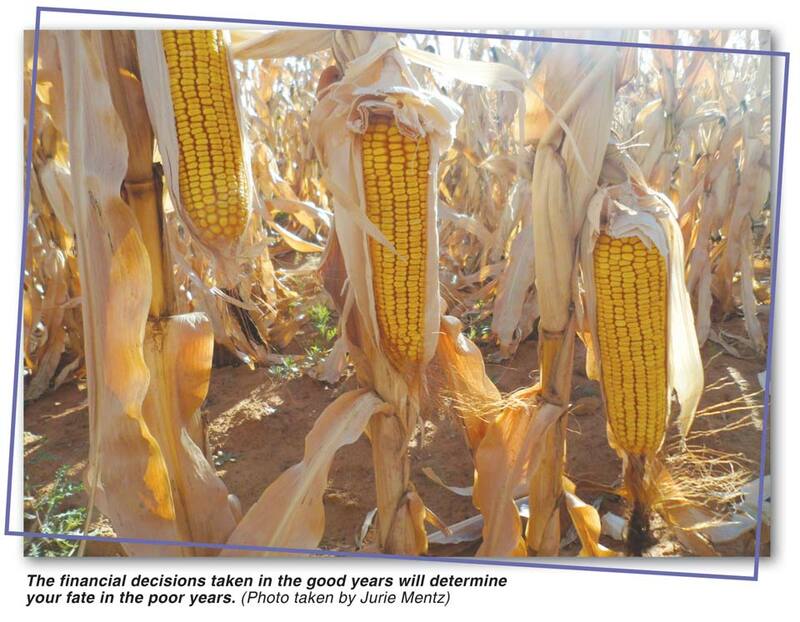 In this regard it is found that poor financial management and decision making is the most important cause for some 80% of farmers who lose their farms and not poor production farming conditions. When financial management comes to mind, one should remember the simple formula: Profit = Income - Expenditure (P = I - E). One should first of all manage your expenditures very well and reduce it as far as possible without impeding your business. Remember you can only manage your costs if you manage your business according to a comprehensive budget. Secondly improve your income to improve your profit. The financial decisions taken in the good years will determine your fate in the poor years. Therefore one should rather reduce your debt in the good years with the additional profits made. Also consider to rather use additional profits to conserve your resources, such as applying proper conservation farming methods to conserve and improve the fertility of your soil, to conserve soil moisture, to conserve and improve the quality of your grazing or to build up a fodder bank. In the good years, rather invest any surplus funds in productive assets – assets that can generate income – than non-productive assets. 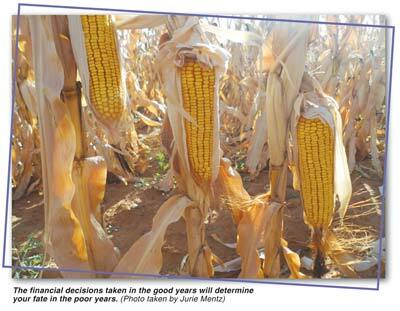 Our South African farmers are mainly dependant on themselves for survival with very little support from government. Therefore your financial management is of the utmost importance during good years and difficult years. You need to stay focused on your farming business by managing as a skilled business manager and take careful and thorough considered financial decisions. This then means you must have the necessary financial information available commencing with a comprehensive budget. To apply improved financial management the farmer must accept ownership for everything that happens on the farm. The farmer must take the full responsibility and maintain integrity towards himself and all other parties involved in the business. A realistic step in this regard is for instance to improve your credit worthiness with your financiers during the good years. The result will be that they will be more lenient towards you in the difficult times – they know you as a man of your word. Keep an eye on your cash-flow and manage it according to a cash-flow budget. Consider the profitability of your enterprises regularly. Consider opportunities for value-adding. Also be very mindful of your personal costs during the good times and manage it according to a personal budget. Interesting, if you consider this article, you will find that we referred to a number of aspects that we have mentioned in more detail in previous articles. This article is a bit of a summary of a number of previous articles. It also indicates again that financial management is not only the link between all aspects of the farm business, it also ‘oils the wheels’ that allow the business to function more effectively. Without capital to meet the short-, medium- and long term needs of the business everything will grind to a halt. Therefore apply top class management and especially financial management during the good years and you will survive the difficult years that more easily. Or manage the good years as difficult years and you will find that the really difficult years will then not be that difficult.